As avid listeners of the wonderful NPR podcast Pop Culture Happy Hour know, the Washington D.C.-based staff of NPR recently moved to a shiny new headquarters. The only problem? The beloved NPR Music web series Tiny Desk Concerts, filmed at the cramped desk full of kitschy decorations belonging to All Songs Considered host Bob Boilen, needed extra care to make the move. So NPR Music brought in OK Go, masters of the visually exhausting music video, to perform 223 takes of their song “All Is Not Lost” as the various pieces of the Tiny Desk set moved to their new location. 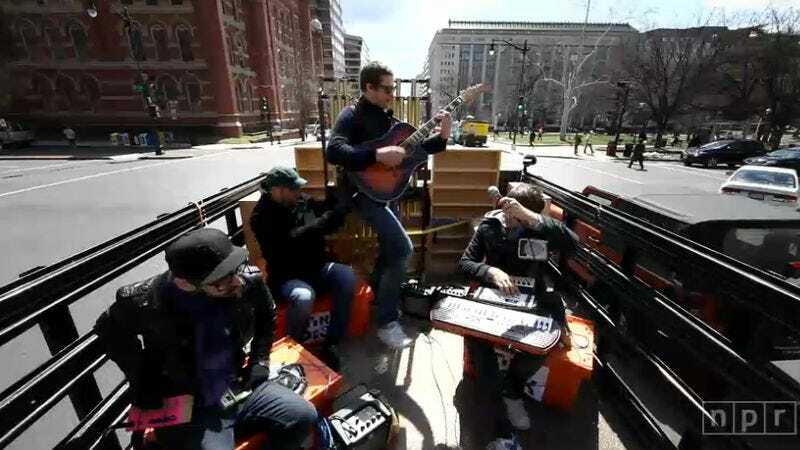 So take a journey with OK Go as they travel through the old NPR headquarters, onto a flatbed truck, around the streets of D.C., and finally up into the pristine new NPR building. And stick around for some charming outtakes from the shoot while the band drove around on the truck.